The NuWave Oven is a kitchen appliance that cooks food using three cooking methods: convection, conduction and infrared. This product is sold online and through infomercials on television. It is capable of cooking almost any type of food including chicken breasts. This product allows the fat to drip off of the chicken and offers added convenience because the chicken can be placed in the oven even while frozen. Assemble your NuWave Oven by placing the liner pan inside of the base. Place the cooking rack in the tallest, four-inch position. 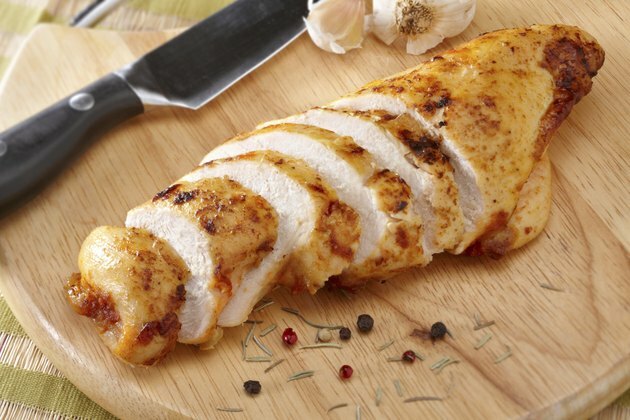 Season the chicken with your desired seasoning blend such as salt and pepper, lemon pepper, chipotle or Italian seasoning. If you are cooking frozen chicken, rub a few drops of olive oil or water on each piece of chicken before seasoning so the spices stick. Place the dome on the NuWave Oven, making sure that it is securely in place around the base. Set the oven to cook the chicken for 10 minutes on each side if using fresh chicken breasts, or 13 minutes on each side if they are frozen. Flip the chicken breasts after the first side has cooked and continue cooking for the recommended amount of time. An internal thermometer will register at least 170 degrees F when the meat is cooked through.